Titanium Round Bar is a unique metal. As per its specific strength titanium has no equal among industrial metals. Titanium is harder in 12 times than aluminum, in 4 times than iron and copper. Yield strength of titanium is higher in 18 times than of aluminum and in 2,5 times than of iron. At extremely low temperatures titanium is not damaged as other metals but vice versa becomes firmer. Therefore titanium is a basic construction material of space vehicles. Our special metal products are routinely supplied for titanium applications in the aerospace, medical, sport and recreation, pulp and paper, chemical processing, and metal finishing industries. We stock a variety of commercially pure grades and titanium alloys in coil, sheet, plate, rod, bar, wire, and tubing forms. Titanium is 30% stronger than steel, but is nearly 50% lighter. Titanium is 60% heavier than aluminum, but twice as strong. Titanium has excellent strength retention to 1,000 degrees Fahrenheit. 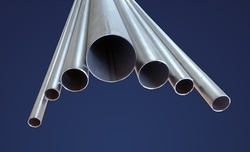 Titanium is alloyed with aluminum, manganese, iron, molybdenum and other metals to increase strength, to withstand high temperatures, and to lighten the resultant alloy. Titanium’s high corrosion resistance is also a valuable characteristic, as when exposed to the atmosphere, titanium forms a tight, tenacious oxide film that resists many corrosive materials, particularly salt water. We are one of the Stockist & Manufacturers of Titanium Round Bars in India. 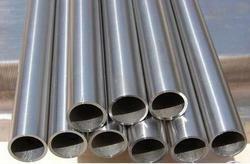 Titanium Round Bar products are available in Grade 2 5 Bars as per ASTM , GB, DIN, ASME. and other titanium grades in round sizes up to 750mm Dia & 6000mm in Length, rectangular and square sizes are also available. Specifications for titanium bar include aerospace, medical and industrial. 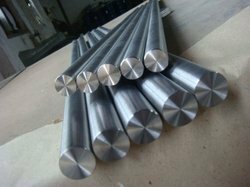 Titanium Round Bars Grade 5. Titanium Round Bars as per ASTM , GB, DIN, ASME. We can offer round Bar up to 750 mm Dia & 6000 mm in Length. As a family, titanium and its alloys have developed a mystique as a nightmare to machine. This is simply not the case. Experienced operators have compared its characteristics to those found in 316 stainless steel. Recommended practice includes high coolant flow (to offset the material's low thermal conductivity), slow speeds and relatively high feed rates. Titanium Grade 1-4 is pure Titanium, the other grades are alloys. Pure Titanium is used due to its high corrosion resistance, the alloys because of the extremely high strength to weight ratio. Grade 1. Pure Titanium, relatively low strength and high ductility. Grade 2. The pure titanium most used. The best combination of strength, ductility and weldability. Grade 3. High strength Titanium, used for Matrix-plates in shell and tube heat exchangers. Grade 5. The most manufactured titanium alloy. Exceedingly high strength. High heat resistance. Grade 7. 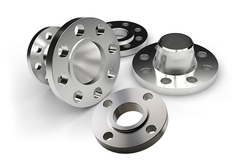 Superior corrosion resistance in reducing and oxidizing environments. Grade 9. Very high strength and corrosion resistance..
Grade 12. Better heat resistance than pure Titanium. Applications as for Grade 7 and Grade 11. Grade 23. Titanium-6Aluminum-4Vanadium ELI (Extra Low Interstitial) Alloy for surgical implant Applications. Machinery equipment, electroplating equipment, medical, all kinds of precision machinery part etc. Titanium Grade: 1-4 is pure Titanium, the other grades are alloys. Pure Titanium is used due to its high corrosion resistance, the alloys are used because of their extremely high strength to weight ratio. Items with thin wall and narrow tolerances machined out of solid bars should be redesigned close down to final size and kept a day for stabilization prior to final machining of the item.